Everything below applies to the iPad and iPod Touch, too, but since far more people have iPhones, that's what I discuss. I'm an iPhone user myself, and I'm constantly scouring the App Store and blogs around the world to find the best Japanese dictionary apps. JLT on the iPhone: The touchscreen of the iPhone lets you use handwriting recognition to easily enter and look up unknown kanji and words, and with regular keyboards and spoken word entry you'll always have the best way to look up Japanese right at hand. EBPocket for iOS is a superb Japanese dictionary app due to its advanced search features, expandability, and fast performance. The JLT dictionary suite (all free except Eijiro) gives the most convenient, complete, and useful set of resources for anyone learning Japanese or using it in their daily lives: Edict (heavily customized by JLT to give much better English-to-Japanese search results than the standard Edict that comes with the app and is widely available elsewhere) for quick lookups; Enamdict, a huge dictionary of Japanese proper names, including place, personal, and commercial names; Conjugations, which not only helps you conjugate verbs but also lets you enter a conjugated form to find out what tense of what verb it is; Kanjidic, which is exactly what you'd expect--it also includes stroke order diagrams to teach you how to write each kanji properly; and the crown jewel of the JLT system, the JLT version of Eijiro--Eijiro is by far the most complete Japanese<>English dictionary available, but it's made for educated native speakers and in its native state is very difficult to use if you haven't memorized thousands of kanji. I've added yomigana to almost every kanji-containing word in both the E-to-J and J-to-E parts of Eijiro, not only making it far easier to read the results of any search but also making it possible for the first time to look up a Japanese word in Eijiro by how it's pronounced as well as by how it's written. You can also add some of the excellent commercial dictionaries in EPWING format like Daijirin and Koujien (both Japanese-Japanese dictionaries), the intermediate and large versions of Kenkyusha, the Nouveau Petit Royale French<>Japanese dictionary, and others; plus any of the excellent free EPWING dictionaries, some of which are described elsewhere on the site. How good is it? In short, superb. The combination of EBPocket Pro, the JLT dictionaries, and Tegaki Keyboard is far and away the best Japanese dictionary system you can get for your iPhone--or any other platform. There are also apps that let you use the camera to scan in a character or word you see written somewhere. The best of them are Japan Goggles and Yomiwa. They're not perfect, but in the right circumstances they can be extremely useful--they won't replace a good dictionary program and dictionaries (mostly because they don't work at all in many circumstances, and are limited by very small dictionaries when they do), but they can be very useful adjuncts to them. And of course you can find all sorts of other apps to help you in your Japanese learning and life, everything from flashcard apps to help you learn kanji and vocabulary to map apps telling you how to find the nearest craft brewer or gas station or avoid speed traps. Update to iOS 8 or 9 if you haven't done so already (the infamous bugs have been fixed; earlier versions don't allow the handwriting recognition app you'll need). Install EBPocket Pro and the JLT dictionaries. Install a Japanese handwriting recognition keyboard. 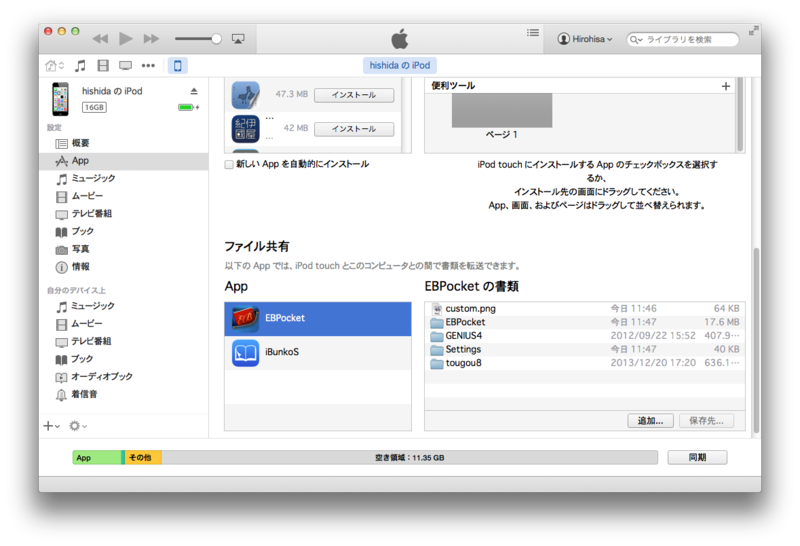 Installing JLT dictionaries to EBPocket: Instructions for several methods are described in Japanese on the EBPocket home page, but here's a quick guide to the easiest one in English. It may be helpful to consult the screenshots in the Japanese instructions, even if you'd rather follow the English instructions here. Buy the EBPocket Professional app from the App Store. It's only US$4.99, and the free version lacks the advanced search features that are necessary to get the most out of a huge dictionary like Eijiro. Move the entire folder for each dictionary to the EBPocket folder on your iPhone. The easy way is through iTunes (the only limitation is that you can't delete the dictionary that comes with the app through iTunes, wasting a few tens of MB of your device's precious memory); if you don't have a computer with iTunes handy or if you do want to delete that dictionary, then you can use the alternative method. Open iTunes and connect your iPhone, iPod Touch, or iPad. Click the icon for your device near the upper left-hand corner of the iTunes window. In the left-hand column, tap "Apps." You'll see a section in the right window called "Apps," listing all your apps, including EBPocket. This is NOT what you want. Use the right-most slider to scroll down past that section until you get to a section labeled "File Sharing" (below that, "The apps listed below can transfer doccuments between your iPhone/iPod/iPad and this computer."). There should be far fewer apps listed in this section--here you choose EBPocket. Now above the window to the right of the app list, you'll see the heading "EBPocket Documents," and the contents which will probably just be a file called "custom.png" and folders called "Settings" and "EBPocket," followed by a lot of empty space. Drag and drop the folders of the dictionaries you want into that empty space. In the screenshot on the developer's site, you can see that he's installed dictionary folders called "GENIUS4" and "tougou8." Note: it IS possible to drop them into the EBPocket folder, but if you do you won't be able to delete them later if you ever update the dictionaries or just decide you don't need them and want to save space (unless you use the more difficult alternate method linked above). You can remove a dictionary from the dictionary list in the app itself by deleting it in the program (see next steps), but the files will still be taking up memory on your device; to actually delete the files, select the dictionary folder you want to remove, hit the "Delete" button on your computer, and click "Delete" in the ensuing pop-up. The previous steps put the dictionary files onto your device but the app still isn't set to use them. To do that, open the EBPocket app and tap the Book icon at the bottom right, tap Dictionaries at the top of the screen, and tap Edit. Tap the "Do Not Enter" sign next to EDICT2 (the dictionary that comes with the app); a "Delete" tab will appear next to it; tap that to delete it. In the next step, you'll be replacing it with the JLT version. Now, tap "Add" and add the dictionaries you want. After adding them, grab the icon to the right of each dictionary and drag it up or down to where you want that dictionary to appear in the order of dictionaries in the Dictionary Menu. Tap Done to get out of the Edit screen and then Search to get back to the Search screen. Here are the standard JLT dictionaries. Other than Eijiro, the JLT dictionaries can be downloaded for free from their respective pages. Edict, Enamdict, and Kanjidic are all based on the dictionaries of the Electronic Dictionary Research and Development Group, under the fearless leadership of Prof. Jim Breen, at Monash University in Australia (copyright and license terms), and Conjugations, while put together by JLT, uses data from EDRDG and many other sources. See the pages below for more information and to download the free dictionaries. You can download or buy these dictionaries once and also use them on your Android or regular Windows, Linux, or Mac computer as well as your iOS device. Eijiro--While the Japanese-English dictionaries in a typical electronic dictionary have about 100,000 entries each way--and the best have about 250,000--Eijiro has over 2 million entries each way. Not only that, but Eijiro's entries are rich with variants and example sentences (over half a million each way). Not only that, but, unlike any other version of Eijjro you can find, the JLT version shows the pronunciation of almost every Japanese word, and it allows you to search for words by entering either kana or kanji (or even romaji, via a setting in EBPocket). The JLT conversion of the Eijiro dictionaries and sale on this website are by written permission of EDP (obtained August 11, 2008). "Eijiro" is a registered trademark of Sachiko Michihata. The current JLT version of Eijiro is based on v. 150 of the Eijiro database. Edict--for everyday things, it's got 130,000 J>E and 175,000 E>J entries, all with the full information right in front of you--kanji, hiragana pronunciation, English definition—in nice compact entries. The JLT version has been heavily edited from the original to offer vastly improved English-to-Japanese search results. Plus, you can instantly jump from any verb in Edict to its entry in Conjugations, below, then jump back! Enamdict--kanji and readings for just about every personal, place, and commercial name in Japan--with Japanese versions of many foreign names, too. Kanjidic--a dictionary of all 6355 kanji in the JIS X 0208 set, each with the definition in English, a full set of information about about the character, and a stroke order diagram to teach you how to draw the character correctly. Combined with the various kanji lookup tools of your iPhone, this is the easiest and most useful kanji dictionary you'll ever find. Conjugations--Quickly find out how to say and write any tense of any verb, or you can enter a conjugated form of a verb to find out what tense it is and what the base verb is (it’s not always easy to tell--unless you've got the Conjugations dictionary), then jump to that verb's entry in one of the other dictionaries. There are also a wide variety of other dictionaries available around the web, everything from English-English dictionaries, Sanskrit-English, Japanese-German, and archaic kanji to various encylcopedias, Shakespeare, and texts and dictionaries for various religious studies (the Buddhist terms dictionary is especially impressive) and specialized interests, like military terms, flowers, biology, computer, and business terms. Some of the most useful are listed here on my site, along with a few others I've converted from free and open sources and data made available to me. Some you only find if you search the App Store in Japanese ("手書"), some only in English. Prices below are in US dollars and of course yen, depending on which app store you use. Links below are to the Japan App Store; to find them in the US App Store, search for 手書 or the app's name in the store from your iPhone or iPad itself or from iTunes. You can change the auto-enter delay and even turn auto-enter off, which is great. The delay determines how long after you stop writing it automatically enters its first choice--too short and it enters at any pause, before you finish writing the character or before you have a chance to confirm what it thinks you're trying to write. But an experienced user would keep it very short to be able to enter character after character very quickly. You'll probably want to start with it turned off. The default writing area is fairly large, but you can also choose an even larger one. Having enough space to write really lets you write faster--you don't have to be so precise about moving your big old fingertip inside a tiny box. It has arrow keys to move you back and forth one space at a time in the text you've entered. This sounds minor but it's a big convenience. A very thoughtful feature. It has a big search key (magnifying glass icon), which some of the other keyboard apps lack. The extremely generic name makes it very hard to find anything about the app online. These folks are great developers but they really need to hire a marketer. The other minus is that, although the developers have a number of apps in the US and other app stores, this app is available only in the Japanese app store. You can establish an account there, switch your iPhone/iPad/iPod Touch to the Japanese store, buy the app, then switch back to your regular app store, but it shouldn't be necessary. Mazec--$8.99 or 1080円 (US or Japan app store, probably also available in other national app stores). A great keyboard, but given that Tegaki Keyboard above works just as well and has better features for half the price, Mazec isn't my top choice. But it does everything right: big enough writing area, all the necessary keys, finds everything I tried to write on the first try, including the characters that stumped MyScript Stack and Rakibo. If you can't access the Japanese app store to get Tegaki Keyboard, Mazec is an excellent fallback. Rakibo--About a buck in the US and Japan app stores (and probably others). Good, but doesn't work as well as the options above, and has a clunkier interface, so I don't recommend it. MyScript Stack--not very good for entering Japanese.